The generous Country Porch offers plenty of rocker space in the design of this Country Log Home Plan with its four generous sized Bedrooms. This Country Kitchen has its cooking surface unit placed in a brick arch beside the built-in ovens. The generous Country Porch offers plenty of rocker space. The entry is one step higher than the open Living Room, Dining Room and Kitchen. A rail edges the hall and allows a very open feeling in the living areas. You have a long view of the fireplace and its cooking crane as you enter into the house. Wall space for a buffet is provided near the fireplace. Double windows look over a covered walkway from the Garage or Carport. This Country Kitchen has its cooking surface unit placed in a brick arch beside the built-in ovens. A kitchen desk is opened to the stairway hall. There is also room for a small kitchen table. 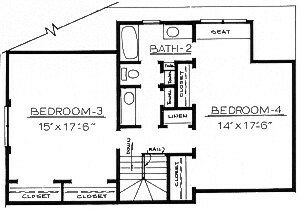 The Master Bedroom has a dressing area with vanity and closet, connecting to the hall bath. 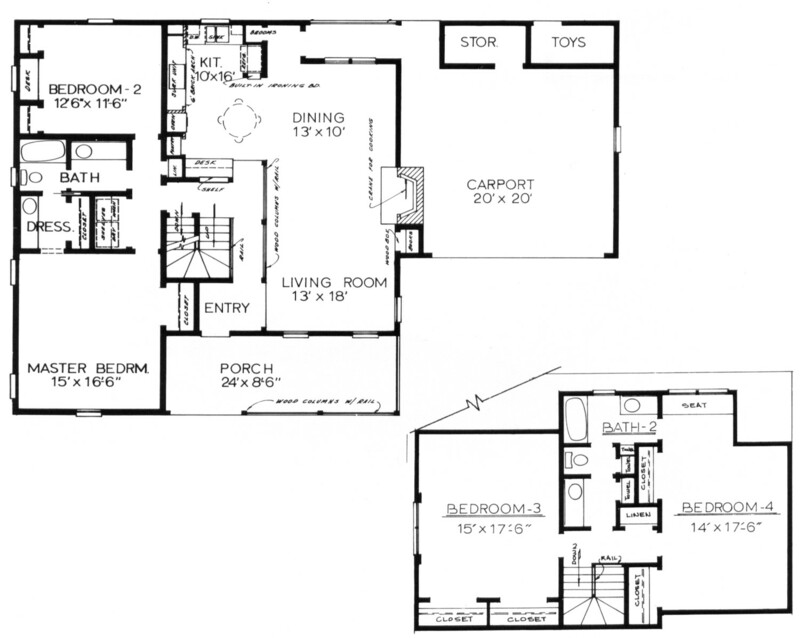 For a separate master bath, an alternate layout is shown in the construction plan. The washer and dryer is located in the utility closet off the hallway. A window seat for toys or games is used between two closets in Bedroom-2. While the Garage opens to the front, it can be altered to have access from the side or the rear, eliminating the storage areas. Stairs lead to the basement area. Upstairs two large Bedrooms share a compartmented bath, each with its own vanity. Ample closets are provided upstairs; the bedrooms each have long closets; a wide hall linen closet; towel closets for the bath. Bedroom 4 has a window seat below its double windows. Dormer windows can be added to the bedrooms for more light. 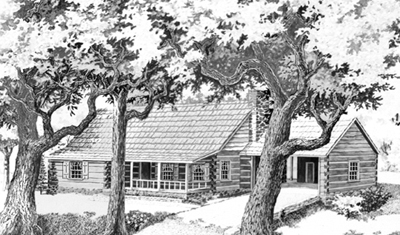 Chinked, 6x12 pine dovetail Logs are used to construct this 'open living' Log Home. Other types of logs can be substituted by your Log Supplier. 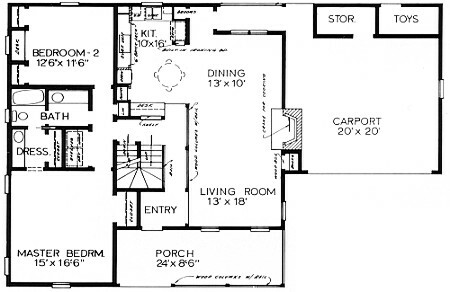 Alternates are included for an alternate master bath and screen porch.